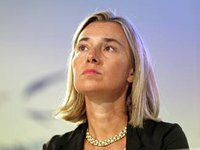 High Representative of the European Union for Foreign Affairs and Security Policy Federica Mogherini has said that in Milan on Wednesday she intends to discuss the tension in the Black and Azov Sea regions with the foreign ministers of Russia and Ukraine, Sergei Lavrov and Pavlo Klimkin. "Tomorrow in Milan at the OSCE ministerial meeting, I would have bilateral meetings separately with Foreign Minister of the Russian Federation Sergei Lavrov and with Ukrainian Foreign Minister Pavlo Klimkin," she told journalists in Brussels. "I would definitely raise the tensions in the Azov Sea," she added, speaking about topics she was going to discuss at these meetings. Mogherini said that Brussels is "also extremely concerned about developments in the Azov Sea." She said that "the activities in the Azov Sea slow down enormously." She said that this also concerns the vessels that are also carrying EU member states' flags. "We have been suffering an impact on our own economies," Mogherini said. The European diplomat said that the EU has always backed Ukraine's territorial integrity. "Our position has been very clear. We always stand very firmly at the side of our Ukrainian friends for their territorial integrity, for the sovereignty," she said.